The weather outside is frightful.....yes....3 days of snow in APRIL! I can't think of a better antidote to the white landscape than a bunch of colorful tulips! 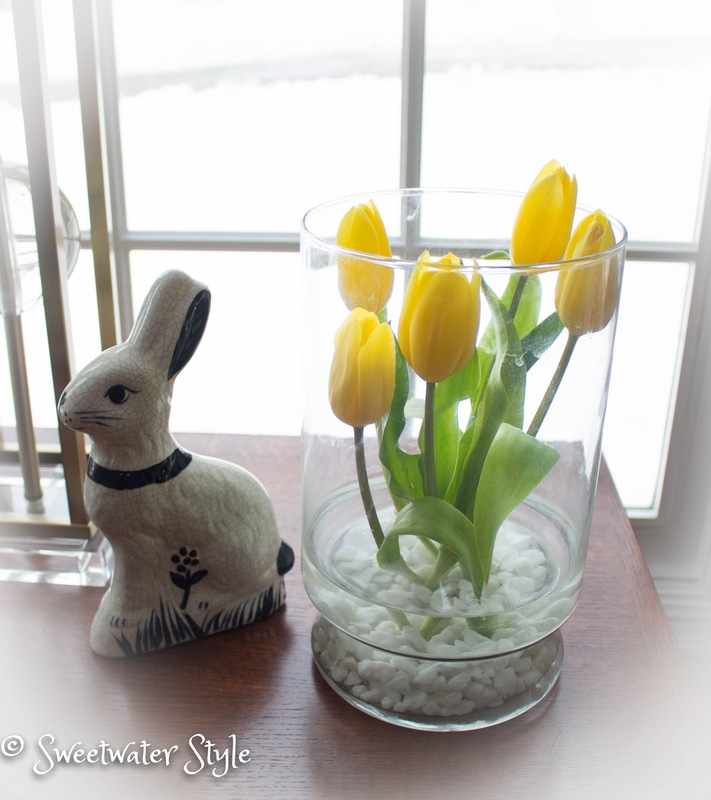 I want to show you how I have been using tulips to bring Spring into the decor around here. Then....read on to learn some fun facts about how to care for your cut tulips. Tulips are readily available in just about every grocery store flower department! Right now, you can buy a bunch of 10 tulips at Trader Joe's for 4.99! Look at how I used that one FIVE BUCK CHUCK bunch of flowers here at Sweetwater. I put some white stones from the dollar store in the bottom of a clear vase with tall straight sides. I added a couple of inches of water mixed with floral preservative. 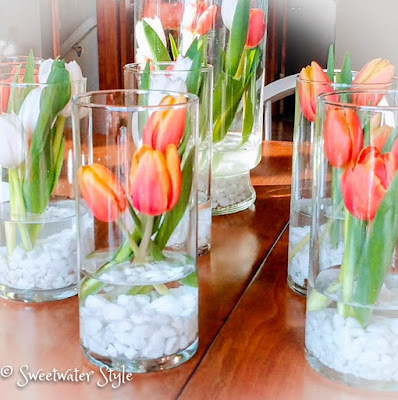 The tulips are cut at various heights and arranged so they are supported by the glass. This arrangement used five tulips....so there were five others to use. The green vase has floral foam in the bottom. The hydrangeas are "faux"....no worries about them drooping! The floral foam allows the tulips to be arranged in a radiating form. 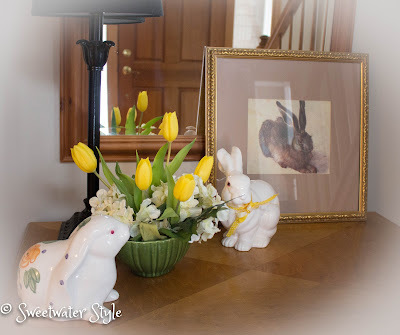 and there you have two Spring vignettes for little or no money. Sweetwater Floral was asked to create 50 centerpieces for an education conference this week. We wanted to keep the cost down and still provide something with visual impact. Look at these variations of the same theme! I love the way the vases support the stems to keep them from falling over. I know this has inspired you to head to the store and buy yourself some tulips. Here are some things you should know so they last as long as possible! 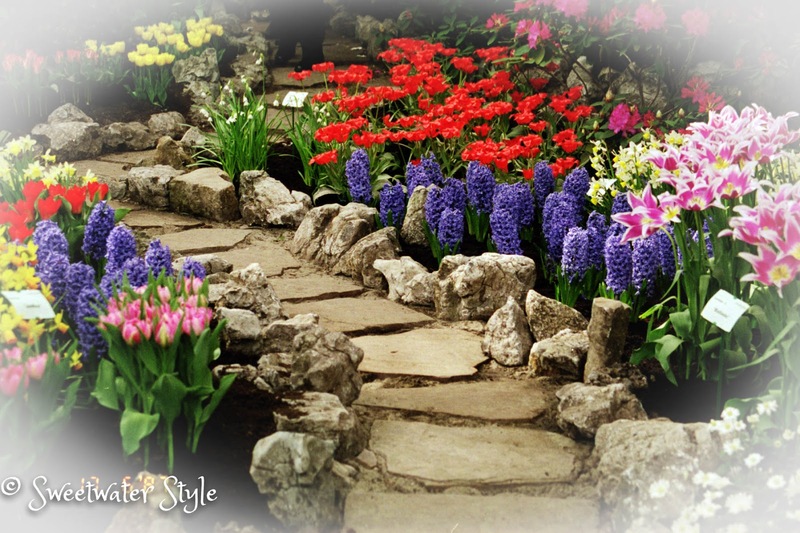 Did you know that tulips continue to grow after they are cut? Crazy....but true. Don't be surprised if those tulips keep stretching as much as 2 inches. 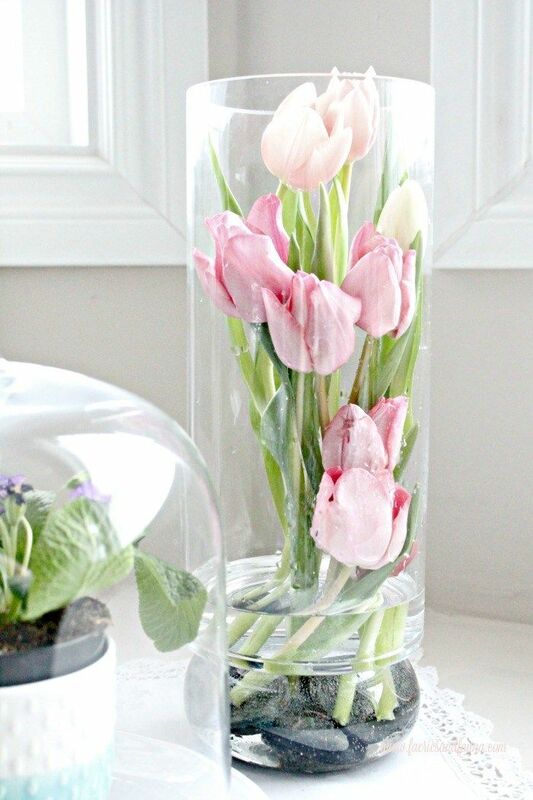 Buy tulips that are tightly closed and keep them in the dark and in cold water until you are ready to arrange them. As with any cut flower, you need to recut the stem at an angle when you are ready to arrange them. Don't mix tulips with cut daffodils. Daffodils have a sap that clogs the water uptake of other flowers. I read that when your tulips get droopy you can stick a pin through the throat (top of the stem) to make a hole that will release any air trapped in the stem. I guess you can recut the stems of your tulips after a few days. Take them out of the water and recut on the diagonal. Wrap the whole bunch in a cone shaped paper and put them in water for an hour or so. Here I am almost 20 years ago doing just that! 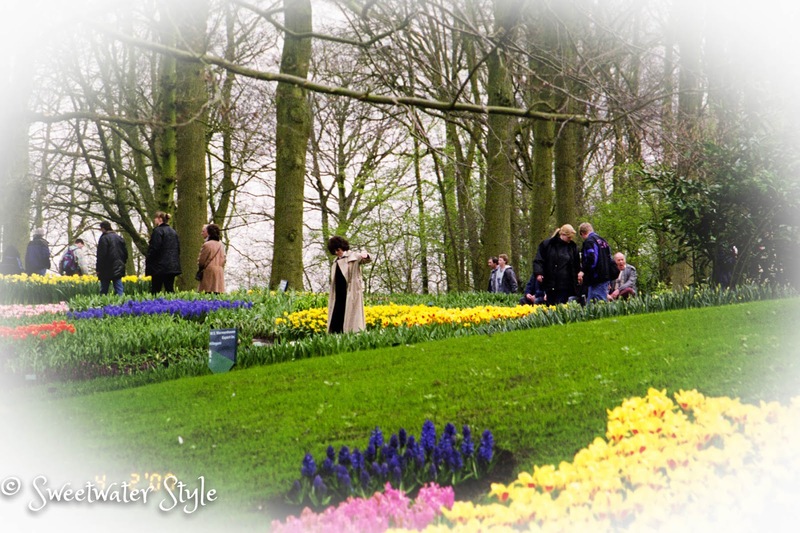 We visited the famous Keukenhof Gardens in the Netherlands. 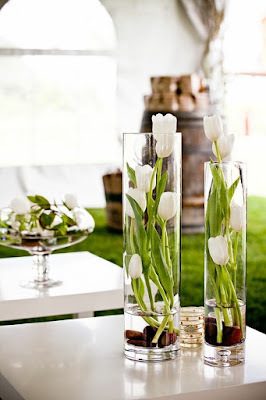 Now that is a way to get your tulip fix that I highly recommend! Pasta Bar For a Crowd! A New Look For Sweetwater Style! A Fairy Garden House From A Stump! Sweetwater Style All Rights Reserved. Simple theme. Powered by Blogger.